Nine years ago when The Colbert Report started, Stephen promised us a “revolution”; and that is exactly what he gave us – that is, if you define a revolution as “a full 360 degree cycle. The world might not be too different from the way it was in 2005; but Stephen spent the night reminding us that the show was still the same too. The episode was filled with TONS of references to past characters, skits and everything else long time viewers would spot a mile away. The night of memories began with Stephen doing The Word one last time where he reminded us of his first show. 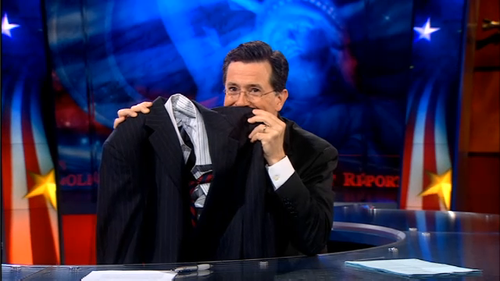 Now this might seem like 9 years ago – because it was – but Comedy Central aired the Best of Colbert all day long, including the first episode. So if you happened to be asleep for the past 9 years, this was the PERFECT chance to catch up – and learned WTF happened. Either way, Stephen’s legacy was secure as he realized he’d accomplished in helping us trust our gut after all these years. Though nothing would prepare us for what happened next. Steven continued by transferring into a Shout Out – another series staple – to the medical company that has been giving him horribly side-effect ridden drugs – and working on his patented Formula 401 – Prescott Pharmaceuticals. This would obviously transfer into one of the show’s funniest recurring sketches, “Cheating Death With Doctor Stephen T. Colbert D.F.A”. Well after years of Stephen literally cheating the Grim Reaper in Chess by making him look, Death wasn’t having anymore of it. Death lunged for Stephen and tried to kill him; but Stephen shot him with his trusty gun Sweetness. That’s right, weeks after Stephen and Death had danced – and twerked – with each other, Death was now … dead. Though with Stephen, killing Death he would of course be rewarded with the greatest gift or curse of them all – everlasting life. With nothing left to do and feeling a little lonely, Stephen left his barren studio behind – his multilayered portrait on the wall now missing Stephen’s reflections. With Captain America’s shield in hand, Stephen joined Santa, Unicorn Abe Lincoln, and Alex Trebek. Whenever someone needs help or seeks answers, THEY. WILL. BE. THERE! 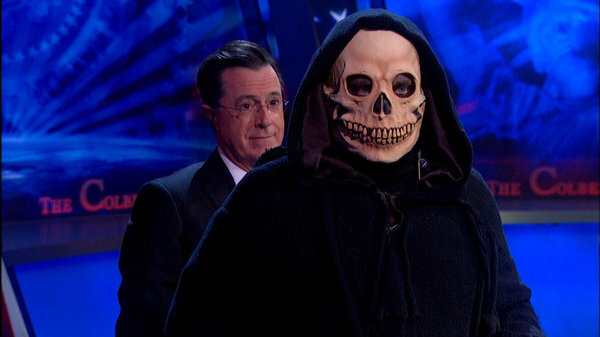 Between gaining immortality and joining the League of Extraordinarily Mythical – and Canadian – Gentlemen, Stephen bid a fond farewell to The Colbert Nation in song with “We’ll Meet Again”. Though it wasn’t just Stephen. Heck, it wasn’t even just him and Jon Stewart who joined him a few seconds after it began. It was EVERYONE! Patrick Stewart, Bryan Cranston, Willie Nelson, Neil deGrasse Tyson, Big Bird, Cookie Monster, Katie Couric, James Franco, Barry Manilow, Arianna Huffington, Kareem Abdul Jabbar, George Lucas, J.J. Abrams, Bill Clinton, and many more all joined Stephen. Even “the Last Great Fire Drake of the Third Age” Smaug appeared to sing with Stephen. It was a whole half hour of Stephen – even the commercials were 70% his Pistachio ads – ; but what about Stephen Colbert the man. Well, Stephen will of course be heading over to CBS to take over for David Letterman; and I can’t wait. What will it be like? Time will only tell; but we can be sure it’ll be with the same amount of laughs and heart Stephen brings to everything else he does. As for what will go on in lieu of The Colbert Report, Larry Wilmore – another former correspondent from The Daily Show – will be hosting The Nightly Show. It all comes full circle, especially with the sign off. After one final heartfelt goodbye and thank you to everyone who worked on his show and watched, Stephen passed it back over to Jon to give a truly ‘Zen’ moment – a clip of Jon and Stephen messing around with the nightly turn over. 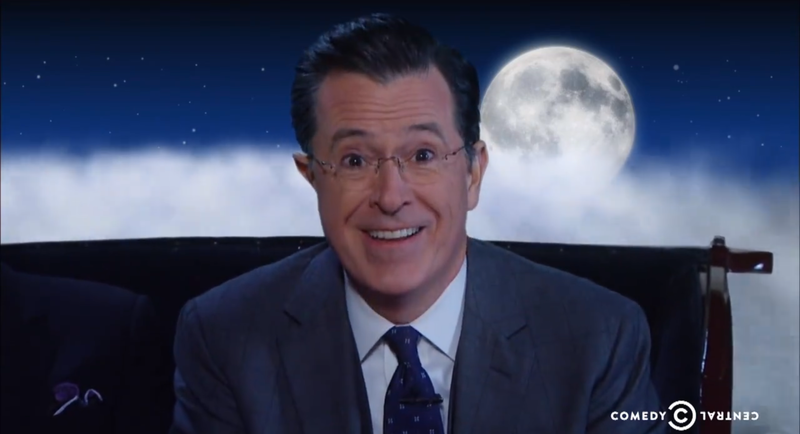 “From eternity, [He is] Stephen Colbert.” – and we are his nation, The Colbert Nation! We love you Stephen and will follow you wherever you head!